Over the last few days, the plants have been busily growing on my windowsills, but the heavy rain (which has led to my village being cut off from the East and South!) stops any activity in the garden. With the Bank Holiday weather rain beating down, I decided to tackle a job i’d put off for a while – tidying up my gardening pots and tools. So I bought a cheap set of shelves and made use of the height – giving me loads more floorspace and some kind of order to the tools, pots and seeds. 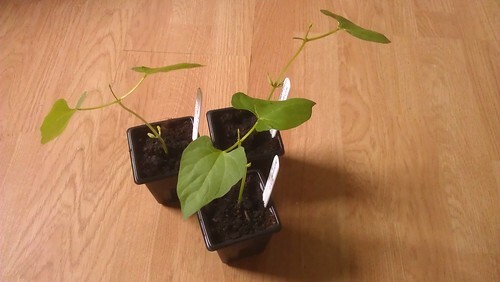 It’s important to keep seedlings moving through the potting-up stages otherwise they can quickly suffer. I’ve just pricked-out the 40 Cineraria ‘Maritima Silverdust’ seedlings that I sowed back in late March. 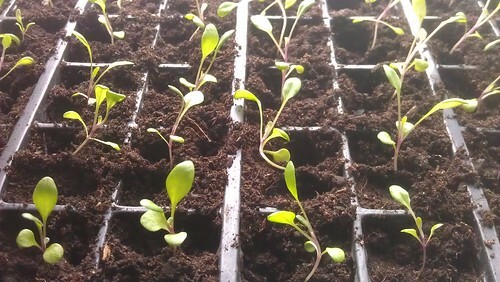 Of all the things I’m growing (apart from one exception), these seem to be the slowest growing, but they now have their own little plugs to grow into before being planted outside in a few weeks time once they’ve grown on, and the cold weather finally goes away. The Cineraria ‘Martima Silverdust’ seedlings. The Dill has not surfaced – it’s been 3 weeks and there’s no green speck on the compost. Is there a trick to growing them? I’ve kept them in my propagator the whole time. Am I just being impatient? Meanwhile, the two Courgette ‘Black Beauty’ plants and the French Bean ‘Blue Lake’ seedlings are standing tall, with the latter looking for their first grasp of cane. I didn’t grow French Beans last year, but this variety did well for me in 2010. The Salvia ‘Farinacea Victoria’ that I potted up almost two weeks ago, are now getting used to their new pots and have started showing signs of a growth spurt too. Last week I also planted out the Sweet Pea ‘Cupani’, so hopefully these are enjoying this wet drought and will be making good use of the wigwams. Fingers crossed that the snails don’t find them for a while.